but it is believed to work through modulation of the noradrenergic and serotonergic systems in addition to its mild agonism of the µ opioid receptor. The contribution of non-opioid activity is demonstrated by the analgesic effects of tramadol not being fully antagonized by the µ-opioid receptor agonist naloxone. Opioid activity is due to both low affinity binding of the parent compound and higher affinity binding of the o-demethylated metabolite M1 to µ opioid receptors. Tandam is well absorbed orally with and absolute bioavailability of 75%.Tandam has a volume of distribution of approximately 2.7 L/KG and is 20% bound to plasma proteins. Tramadol is extensively metabolized by a no. Of pathways including CYP2D6 and CYP3AA as well as by conjugation parent metabolites. The formulation of M1 is dependent upon CYP2D6 and as such is subject to inhibition, which may affect the non-therapeutic response. Tandam metabolites are excreted primarily in the urine with observed plasma. Nausea, vomiting, sweating and constipation, drowsiness, respiratory, depression. A common side effect of most opioids by itself, it can decrease the seizure threshold & when combine with SSRIS tricyclic antidepressants. Store in a cool (below 25°C), dry place. Keep out of reach of children. Rapid intravenous administration may be associated with higher incidence adverse events and should therefore be avoided. Tandam should be used with caution in patients with severe impairment of hepatic and renal function and in patients prone to convulsive disorders or in shock. Tandam must not be combined with an MAO-inhibitor, or within 14 days of discontinuation of it, as potentiation of serotonergic and noradrenrgic effects may result. Simultaneous administration with cimetidine is associated with clinically insignificant changes in serum concentrations of tandam. Therefore, no alteration of the Tramadol dosage regimen is recommended for patients receiving chronic cimetidine therapy. Management of moderate to moderately severe pain. 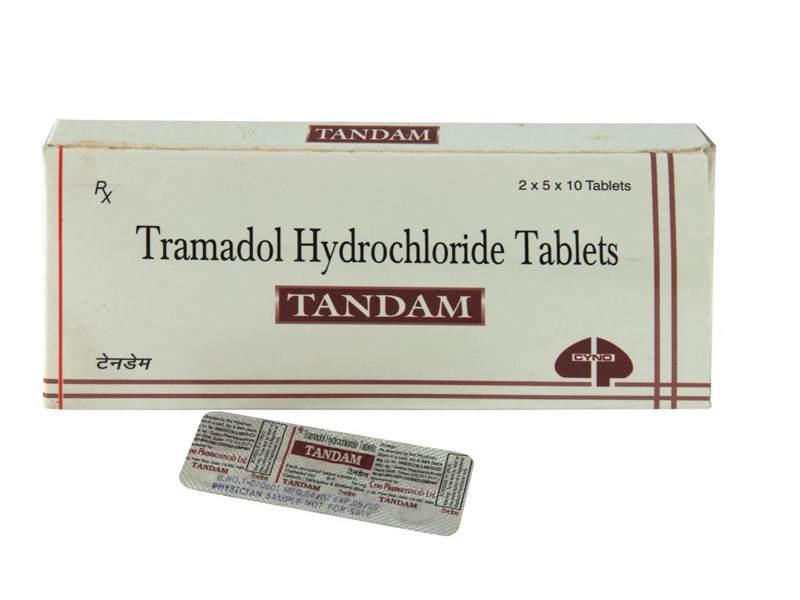 Tandam is contra-indicated in known hypersensitivity to tramadol hydrochloride, or opioids, in acute intoxication with alcohol, hypnotics, analgesics or psychotropic medicines. It should not be administered to patients who are receiving monoamine oxidase inhibitors or within two weeks of their withdrawal. Tandam must not be used for narcotic withdrawal treatment. Safety during pregnancy and lactation has not been established. Tandam should not be given to patients with respiratory depression especially in the presence of cyanosis and excessive bronchial secretions. Few cases of overdoses with tramadol have been reported. Estimates of ingested dose in foreign fatalities have been in the range of 3 to 5 g. A 3 g intentional overdose in a patient in the clinical studies produced emesis and no sequelae. The lowest dose reported to be associated with a fatality was possibly between 500 and 1000 mg in a 40 kg woman, but details of the case are not completely known.